Have you got some gutter rash alloy repairs you’d like to make new again? We can help, AND we can come to you.. If you need a repair, refurbish or full respray for your alloys. We have talented technicians available to come to you. We will repair all scratches / curb damage or even change the colour of your alloys with a full respray, any model of vehicle and most types of alloys such as painted, machined & shadow chrome alloys. Gutter Rash can be a sight for sore eyes for some car lovers.. If you have a small accident with the curb we can come out to YOU & have your alloy fixed in around 45 – 60 minutes per alloy. Prices can start from approx. $99 – $220 inc GST depending on the damage and the type of alloy you have. Machine Face Alloys: As it is impossible to replicate the factory finish on machine face rims without re-machining the entire rim (which can be an expensive fix, we have a technique to restore the alloy to a 95% improvement, however any fine lines that you will see on a machined rim will be smoothed out & will be detectable if you are up close looking at the rim. Painted & Polished Alloys: This is a very simple process where the damaged area is sanded back removing all scuffed areas, filler can be used if required then it is either polished or sprayed followed by a clear coat for that sparkling shine. In addition to our fantastic feedback from our valued customers we can guarantee you will be completely happy with the service provided. 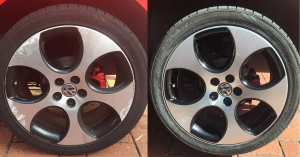 SMART Paintworx do guarantee all of our alloy repairs for a period of three months. In the event that you are not happy with the repair provided. We will return to fix the fault for you at no charge providing there are no signs of new damage. This entry was posted in Gutter Rash Alloy Repairs and tagged alloy repairs, alloy resprays, Repair Gutter Rash. Bookmark the permalink.